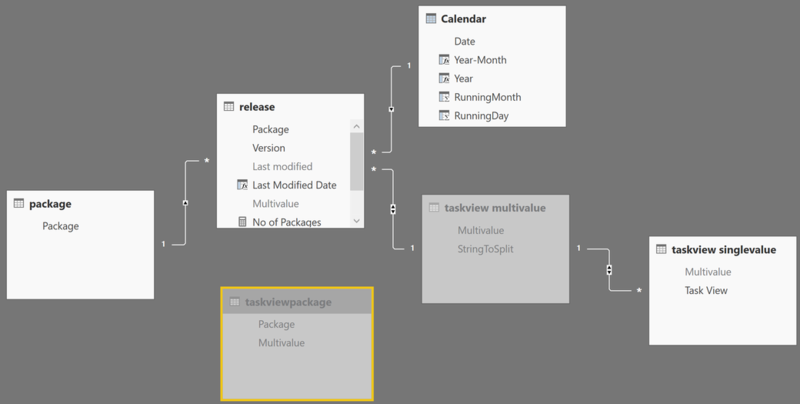 There is one dimension table (package) and two fact tables (release and taskviewpackage). The table package basically contains some information about the package, like the name, the author(s) of the package and similar information. I used some R code to scrape this information from the CRAN website. Down below I present three solutions for a certain problem, each with its own pbix sample file, the data contained in the pbix files is just a tiny piece of the data I'm currently using in the above mentioned report. Except the marked columns and the Calendar table everything is created using R script. These tables allow to extract information like number of releases and to identify the packages that can be used to answer analytical questions for a specific topic - the Task View. Please be aware that there are packages that are not assigned to a Task View, but are also able to help to answer these questions. So please understand the Task View as a first hint and not as finite list. If I want to know how many packages have been assigned to a Task View over time (maybe to get a first impression what's a trend in analytics), I have to combine the tables release and taskviewpackage, but unfortunately I get the following dreaded Error Message: "Can't determine relationships between the fields." This is due to the fact that Power BI doesn't allow to combine fields from remote tables. I guess the term "remote table" is not used that often, but it helps me to better understand the relationships between table. I call tables remote, if they are not connected by a common table, where the common table is of the many side of the table relationship. 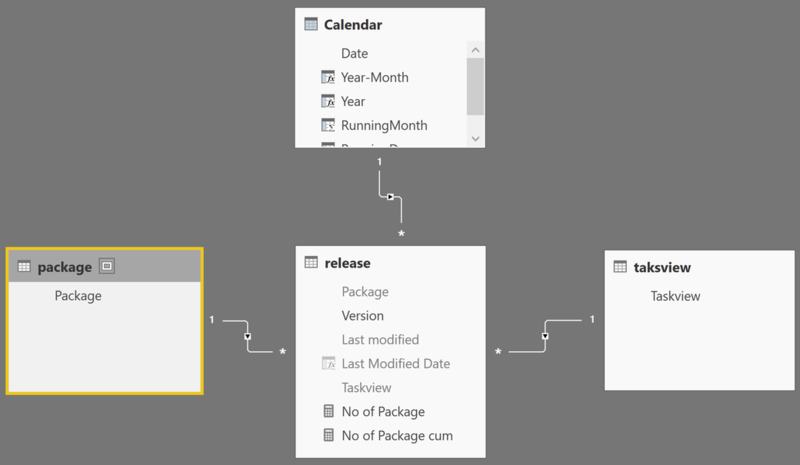 Tabular models unleash their analytical power using the concept of Filter Propagation, this is a great whitepapter about this concept "https://powerbi.microsoft.com/en-us/blog/bidirectional-cross-filtering-whitepaper-2/"
I'm interested in the DISTINCT no of packages over time, for this reason I consider the table release as table of interest. The remote table is the table that is not directly connected with my table of interest, the table taskviewpackage. The remote table is used to filter a table, "table to be filtered". This table is either the "table of interest" or is able to propagate its filtered rows to the "table of interest. This works great, TREATAS(…) creates virtual relationships between remote tables - awesome! So it could be a good idea to think about the data model and find a way to create a physical relationship, please be aware that this will not be possible in all situations. This solution has a slightly different approach instead of using the obvious relationship between the tables package and packagetaskview. I'm creating a phyiscal relationship between the table release and packagetaskview. 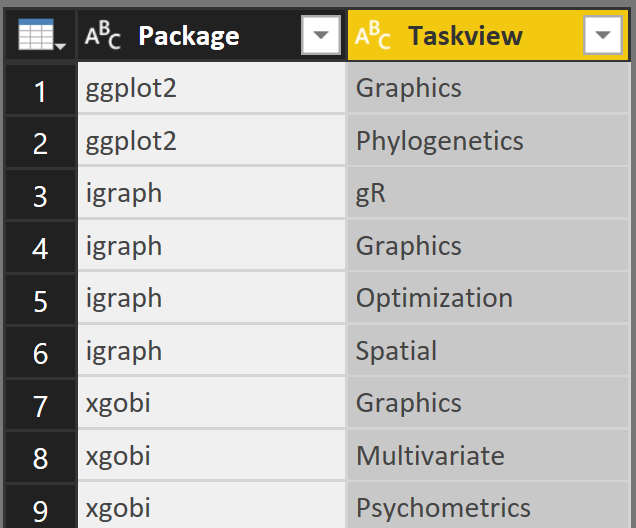 Then I'm creating two additional tables "taskview multivalue" and "taskview singlevalue". My favorite solution that I'm currently using as the foundation for the Analyze R report is based on a simple Merge of the taskviewpackage column into the table release. 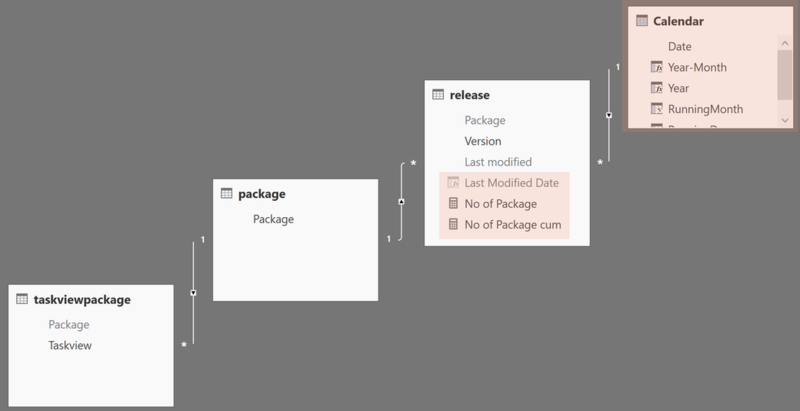 This approach multiplies the number of rows in the release table by the number of taskviews for each package. I use the table taskviewpackage to merge the column Taskview into the release table. Create a new table by referencing the table packagetaskview, remove the package column and finally I remove duplicate rows. For now this is my favorite solution! I hope this post gives you some ideas.